Gonzo’s Quest is a Net Entertainment (NetEnt) online video slot based on the theme of an Amazon adventure, challenging players to search for gold in an Amazon jungle. There are plenty of bonus features such as multipliers, wild symbol, and free spins to help players add coins to their pile of winnings. To play Gonzo’s Quest, players should first place a bet and then hit the Spin button. Gonzo’s Quest has 5 reels and 20 paylines. Players can bet a maximum of five coins per line or 100 coins per game. The coin values range from $0.01 to $0.50, making the maximum bet per spin of reels for this slot $50.00. While playing Gonzo’s Quest, players can turn on or off the ambience sound and the sound effects. They can also view their game history whenever they wish. If they want to spin the reels automatically, they can do so by using the Autoplay feature. 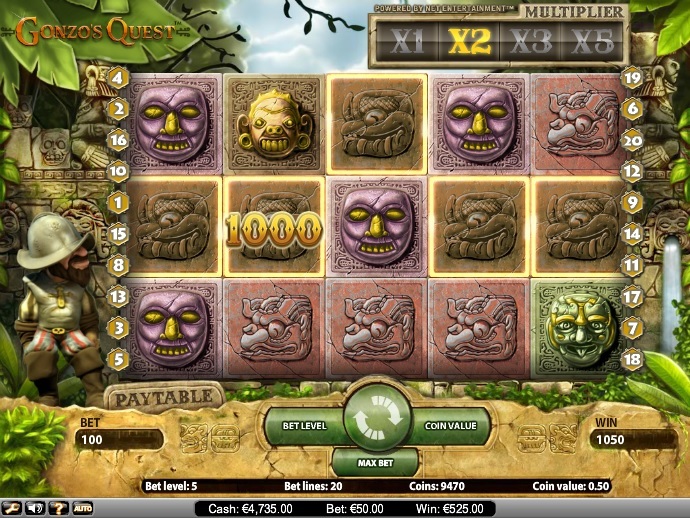 Gonzo’s Quest is a NetEnt online video slot based on the theme of an adventure in the Amazon jungle. The slot challenges players to accompany Gonzalo Pizzaro in his search gold. Gonzo’s Quest features awesome 3D animations, entertaining sound effects, and brilliant graphics. The slot gives players a chance to study the culture and lifestyle of an Amazon tribe, owing to which the reels are full of stone idols used by tribals in their daily life. The most exciting feature of Gonzo’s Quest is its Avalanche Reels Feature, which gets activated whenever players create a winning combination of symbols. The symbols in the winning combination then vanish and the spaces created are filled with symbols falling from above. This leads to more winning combinations, more avalanches, and more prizes. The Question Mark symbol serves as the wild, and players can use it to complete winning combinations. In case of Gonzo’s Quest, the Question Mark symbol can substitute for Free Fall scatter to help players unlock the free spins round. If players land three Free Falls scatter symbols anywhere on the reels, the free spins bonus round gets activated. The free spins or free falls bonus round comprises 10 free spins, but players can activate more free spins while playing a free spin. Whenever players trigger the Avalanche Feature during a free spin, they will receive an increasing multiplier, the value of which will increase with each Avalanche. Players can win a multiplier of up to x15 in the free spins round. Gonzo’s Quest is one of the most popular slots in NetEnt casinos. Players can win the top fixed jackpot of 2,500 coins by creating a combination of 5 Moon Idol symbols. In addition, players can win multiplier values of up to x15, which translates into lots of coins.